Gatlinburg, Tennessee ultimate travel guide. Restaurant critiques, attractions, alpine slides and coasters, hotels, ober gatlinburg, conventions, scenic, shopping. In search of several ongoing conspiracies, we found ourselves at the top of Ober Gatlinburg, a fun spot at the top of the Smoky Mountains in Gatlinburg, Tennessee. Fellow scientist Patrick suggested that we investigate the Alpine Slide and why it is shrouded in conspiracy. 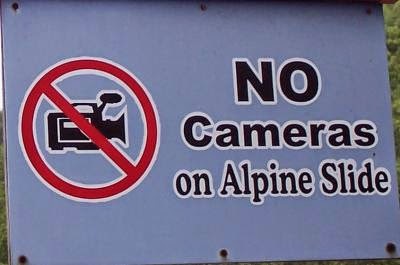 Upon approach of the entrance to the Alpine slide, we encountered the following sign warning us that no camera’s were permitted on the Alpine Slide. We had to find out why. We bought our tickets, $6.00 each to ride the slide and noticed that a ski lift was the only access to the slide. We jumped on the lift, lowered the safety bar, and began the ascent to the top of the mountain. It took approximately 10 minutes to arrive. During our climb, I was able to snap this sky eye view of the Alpine Slide. The photo shows two identical courses. We were not worried as our camera was well disguised. 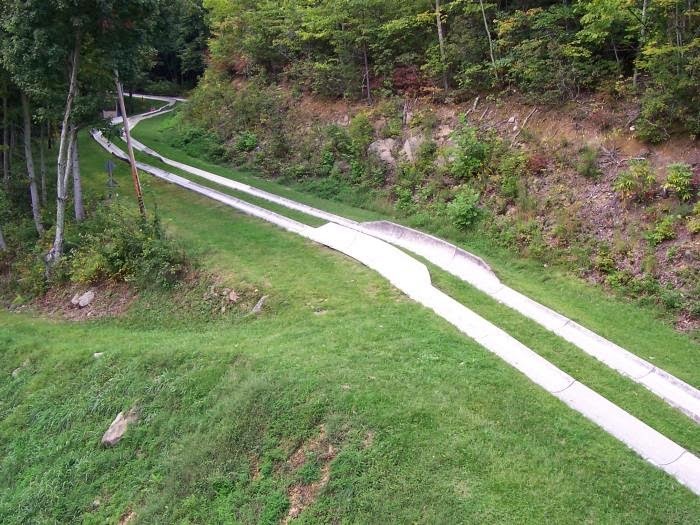 All we can say is enjoy the video of the never before seen Ober Gatlinburg Alpine Slide ride. The Texas Roashouse Restaurant, located on the Parkway in Gatlinburg, Tennessee, is famous for its steaks and BBQ ribs. It was packed with about 75 people waiting outside for a table. It took about an hour before our beeper activated signaling our table was ready. The waitress took us to our table, took our drink orders and returned quickly and promptly took our dinner orders. 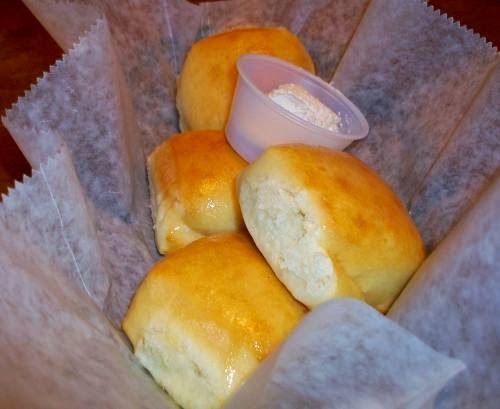 I have been to the Texas Roadhouse before and I remembered the rolls. Our waitress brought them to our table as we were being seated. They were hot, fresh, very good tasting especially with the cinnamon butter that came with the rolls. Clearly, Texas roadhouse knows how to do rolls. 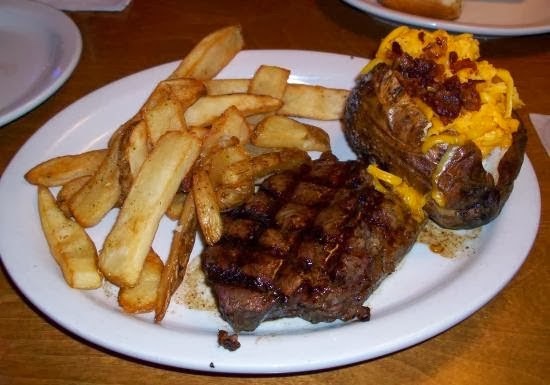 I went with the advice of our waitress and went with the Filet Mignon with a loaded baked potato and steak fries. (You get two sides) After eating about 25-30 shelled peanuts supplied to our table, (There are two tin buckets on every table, one empty, one full of shelled peanuts) our dinners arrived. As you can see, the steak looked delicious and the loaded potato and steak fries were generous. The waitress asked me to check my steak to see if it was cooked to order. I ordered it well done, and informed her that they could butterfly the filet if necessary. (Butterfly steak, cutting the filet in half making it easier to cook thoroughly through without burning the outer steak) It was not to my order. It was almost bloody red and I asked her to please return it and butterfly the steak and cook it to well done. About ten minutes later our waitress returned with the filet looking exactly the same. It was not butterflied. I could see that the steak was not cooked more as the red blood was now oozing out onto the plate all over the steak fries. I sent it back once again asking that it be cooked to well done. Once again, it was returned and I could tell that the chef did not cook my filet further. In fact, it was now cold. So was the potato and fries. At that point, I refused the steak and asked to speak to the chef. I was denied. The waitress said they were to busy and the chef was very busy and behind in his cooking. That explained everything right there. The chef never attempted to recook my steak and figured that I would accept what was served to me. I did not! Since everyone was already finished with their dinners, I completely rejected my steak and stated I would not be paying for it. The manager agreed after coming over to my table and inspecting the steak. He apologized several times and offered any other entree for free. I declined and we left. A 0 Star rating and DOES NOT recommend Texas Roadhouse restaurant Filet Mignon for dinner. It was Saturday night, Gatlinburg, Tennessee, and Joe wanted to see the rest of the Penn State game. We decided to pay Smoky's Sports Pub And Grill a visit. We walked in and there were plenty of TV sets with the football games on which was a good sign and the hostess came over and seated us right away. She asked what game we wanted to see and sat us accordingly. In a few minutes, our waiter appeared and took our drink order and appetizer order. I was feeling daring and ordered the cheese sticks. Ten minutes went by and no drinks but we got the cheese sticks. We placed our dinner orders and asked for our drinks. I noticed that there were no napkins, no plates, no salt, no pepper, nothing on the table. After waiting a few minutes I went and flagged down our waiter. He looked startled! I said could we please get our drinks and perhaps a few napkins and plates. He said sure in just a few minutes. I went to the kitchen and got them myself. 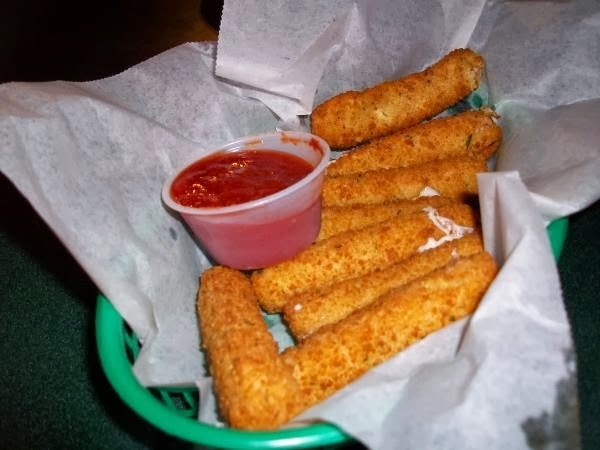 The cheese sticks were OK, a little cold because we waited so long and two of them were empty. Just sticks, no cheese. Say that real fast. My dinner order was a standard fare cheeseburger and steak fries. It came in a basket. There was no ketchup, mustard, well, you get the point. At least it was hot. Actually, the cheeseburger tasted all right. 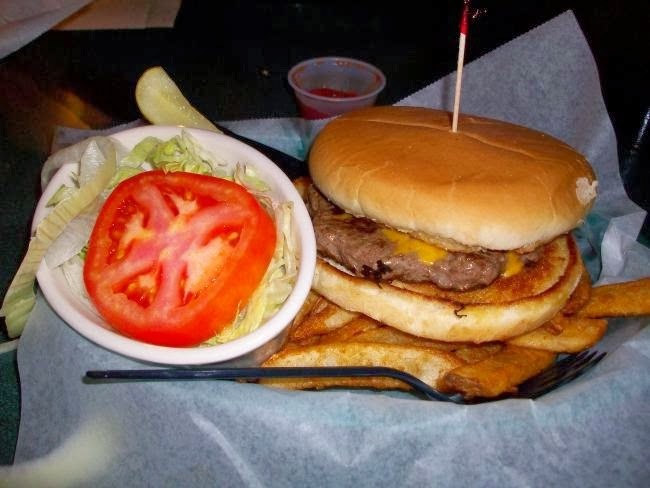 It was well cooked, hot, fresh, (As fresh as frozen patties go) and the bun was toasted and not soggy. All in all, it was OK. The steak fries however, choke, choke, they were terrible. A soggy mess of what once were potatoes in the bottom of the plastic basket. I choked down a few and performed the last rites on the rest of them. The cost was 15 dollars for the empty sticks and burger, and a glass of water. A little steep for what you got. Our drinks finally arrived halfway through dinner. The waiter said, hey, its one of those days man. Same right back at yea with your tip man. Well, Joe was sad that Penn State lost and probably missed the chance for the BCS national championship game, but they would live to play another day. (Can't say the same for the fries though) And yes, I gave him only 15% for a tip. Sidenote: if you find that all the other restaurants are packed, and sometimes in Gatlinburg on a Friday and Saturday night during certain events they are, then go to Smoky's just to get something to eat but expect bad service. Addendum: Smoky's Closed their doors. Perhaps it was bad service, low quality food. As you can tell, the Smoky Mountain Brewery and Restaurant is one of my favorite places in Gatlinburg, Tennessee. 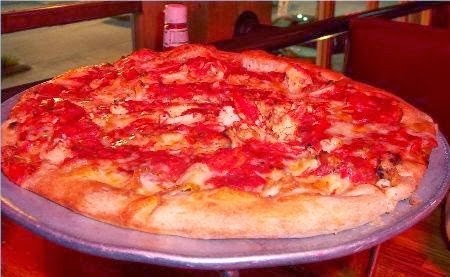 This trip, I decided on their famous home made pizza. I choose BBQ chicken as the topping. During football season, it is better to get to this restaurant early lest you want to wait a while. We got lucky and got squeezed in before the crowd came to watch the many college football games on the numerous flat screen television sets positioned around the restaurant. As you can see, the pizza was a large, a 12 inch pizza. It was delivered in about 20 minutes, which is pretty damn quick as it takes about that time for the pizza to bake in the oven. The crust was thin and crunchy, the cheese plentiful and the sauce zesty and good. And oh yea, the BBQ chicken topping was generous and tasty. The cost was fair, about 14 dollars without tip.